Gun enthusiasts get ready, this one is for you! Ever heard of a 3D printer? Yes, exactly, the one that prints out shapes and they can be used for various purposes. 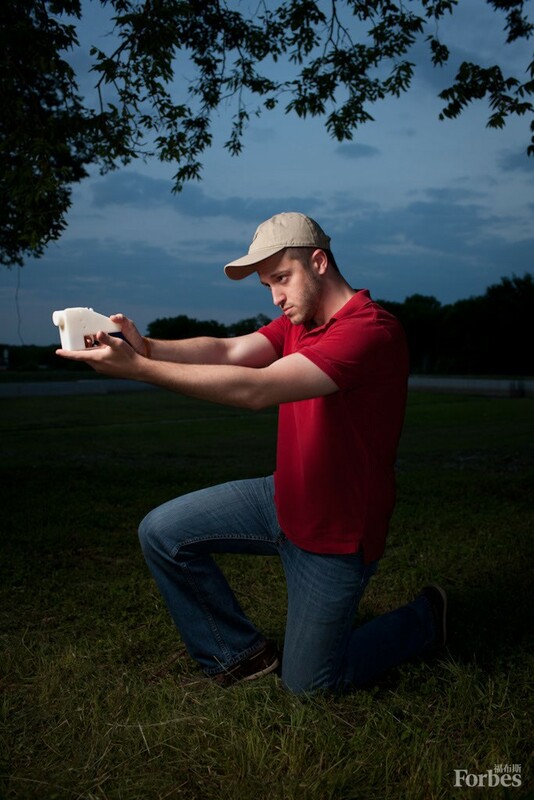 Well, a Texas group, being run by a self proclaimed anarchist has used a 3D printer to make themselves a handgun. Now, before you go all laughing about how funny this may sound, let us assure you it is very much real, as you’ll be able to see in the video that they have posted. 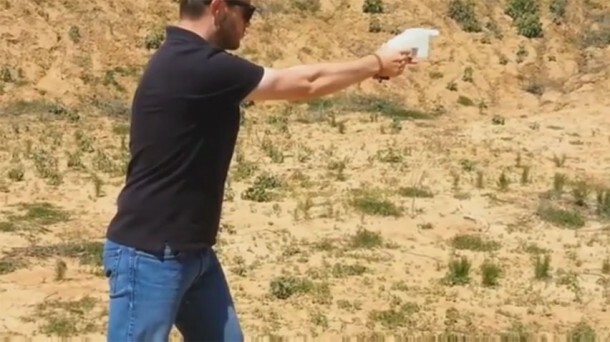 The video is almost a minute long and shows a single shot being fired from this handgun which is being called The Liberator. The handgun is completely made of plastic except for its metal firing pin. The gun seems pretty much okay after the shot has been fired, although the video doesn’t answer the usual questions about its range or accuracy. The manufacturing group known as Defense Distributed is a non-profit group founded by a 25 year old student Cody Wilson who is studying law. Instructions for duplicating its production at your home are provided online on their website. This project has also rung bells of insecurity, and certain authorities are in motion to ban such production of arms, because of them being ‘invisible’ to metal detectors. We will talk briefly about that too, but for now, let’s focus on The Liberator. 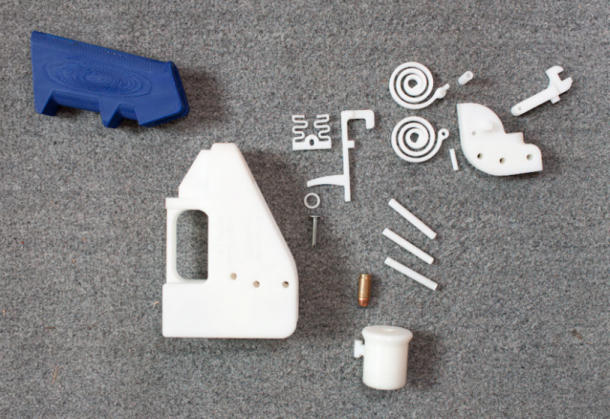 The handgun has been built using a printer that can be purchased online for $8,000 and is known as Stratasys Dimension SST printer. The group named this project as ‘Wiki Weapon Project’ and it is about a year old. The group, until now, was only known for manufacturing plastic parts for firearms which were interchangeable. However, this is a giant step; making an entire weapon of plastic. The Liberator is a combination of sixteen interchangeable pieces all made of plastic except for the nail which is used as a firing pin. The group claims that the barrel can be changed to accommodate four different types of ammo. As mentioned earlier, this video has reignited the cause of banning such 3D printed guns because this might easily fall into wrong hands and do a lot of harm. New York Senator Charles Schumer said; “Passing this law would not only prevent people from making these parts, it would raise awareness on the issue. We’re facing a situation where anyone — a felon, a terrorist — can open a gun factory in their garage.” In his battle for this cause, our New York senator has been joined by US congressman Steve Israel of New York who said; ‘I don’t want to make it easier for criminals and terrorists to bring plastic guns through metal detectors and onto airplanes.’ Mr. Wilson said; ‘For me, it’s important as a symbolic political statement. And that statement is something like, ‘No, the future we imagine is one of personalized manufacture and access to objects. It doesn’t matter what the decision is on the Hill … in this future, people will be able to make guns for themselves. That was already true, but now it’s been demonstrated in yet another technology.” Apart from the reservations, Defense Distributed applied and has been approved as a legal gun manufacturer. Keeping the debate apart, this is definitely a wonder of science and one of the many uses a 3D printer can be put to. When deciding on a Laser printer 3d, on-board RAM (read only memory) could be a consideration. A printer 3d having a regular 64 Megabytes of RAM will likely be slow to print a quantity of documents which can be larger in size than the printer 3d’s memory. If big documents are a consideration, be sure it is easy to upgrade the printer 3d’s memory. The printer 3d driver supplies the application interface to your printer 3d, supplying you on-screen handle over copies, web page size, orientation, resolution, text smoothing and paper thickness and type. Quite a few drivers now involve advanced characteristics and enable you to create your personal custom-setting profiles for speedy selection. Furthermore an excellent driver delivers complete printer 3d management from on-screen, including paper jams and job queue management. Ink-jet drivers oftentimes supply graphical indications of remaining ink levels for every colour.